(Newser) – The United States is warning other countries not to allow Iranian oil tankers into their territorial waters or ports, saying such access may run afoul of US sanctions and not only incur penalties, but also result in catastrophic economic and environmental damage should an accident occur. The State Department reminded the global shipping and insurance industries Wednesday that as part of the Trump administration's "maximum pressure campaign" to get Iran to change its behavior, insuring Iranian tankers will now incur penalties under US sanctions reinstated this week, the AP reports. A few million gallons of leaked oil in the ocean is nothing.An AFLAC salesmen was found leaving the scene with a briefcase full of Iranian signatures.The fish and other ocean wildlife that were "displaced" were not so lucky.Neither were the AFLAC policy holders that failed to read the small print before they drowned.That's winning! HA! HA! Iranian oil tankers are no more less safe or more dangerous than any other oil tanker. 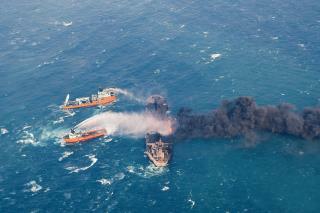 As for environmental disasters; US registered oil tankers are king. Many people in here seem to forget that Iran took 52 US hostages in 1979 and kept them for 444 days. Carter tried and failed (causing the deaths of 8 US military men) to rescue the hostages. Then on Jan 20 They let the hostages go. That happened to be the day Reagan was sworn in. Iran knew they weren't dealing with a peanut farmer anymore.